(attackers) 4 years time to fix and finally made it worse. some guys believes the revolution of 2.0 was a right decision of WG. I wanna talk about Attack Aircraft ,Bombers , Rear Gunners , and AAs. in 1.9 the attack aircrafts were almost useless, ground pounding was not efficient in most of the cases..and attackers were too weak against other types. I think It was after update 1.9.4.. they change some parts, and after that attack aircrafts could win the battle by doing GT and run and hide., also they had more maneuverability in the low altitude than heavy fighter. It was good move to front, however wasn't enough.. but was good. in a good game always there's a hope to change the result even when you're alone and had a bad team ! -for some of them maybe front guns, it was hard but possible. BUT IN BOTH VERSIONS THE REAR GUNNER IS BS ! even in 2.0 when they added the rear gunner control it's not really useful or fun to play ! now please read this part carefully! when you're attacker or bomber has an enemies on its tail and the enemy is close enough ,,YOU'RE DEAD !!! the rear gunner just tickles the enemy! for example when your German bomber Do 217 (tier 6) is chasing by a heavy fighter tier 7, there's no chance. I don't know why they reduced the maneuverability of attackers this much, in 2.0 physics are totally differnet and I don't know Why... the high tiers attacker have less maneuver than a Boing 747! but wait there's more ! the funny part is sometime the rear gunner can hit you and a critical damage from far distance. I remember the gunner RB-17 took me 2 cirtical damage when I was 1000 behind it, two critical damage , pilot injury and engine !! and the worst thing is that you can't evade by maneuver and movements.the only way is go out of its rang or view. but it's not hard problem ! every body know that if you fly too close to the rear gunner it must be a suicide ,and the gunner must be able to kill you easy.BUT IT'S NOT !and the J7W or Heavy fighter can come too close and kill you easily ! and where you are far or when you're active maneuvering , it must be almost impossible to hit with the tail gunner ! BUT IT'S NOT LIKE THAT ! so what they have done is ... made a new system of rear gunner control which is not fun and still bombers and attacker are weak. flying with bombers is not fun. just go up to the moon and drop bombs. - it's unfair for you when you have high alt high tier plane on your tail. - it's unfair for enemy when he has a low alt fighter can't reach you. so what's the solutoin ?!!! when the the enemy is far but flys in a straight line, it's possible to hit but has less chance. also should reduce the chance of critical damage when plane is far. till now the dispersion exist in game, but not as well as it should be. and when the plane is moving and active maneuver it must be almost impossible to hit or cirtical damage specially when it's far. Also for the AAs, in 1.9 and 2.0 no way to run out of the AAs when your are in range ! how much you move you just waste your time and speed. And you what makes me angry ? theyhad 4 years to add this simple code of first person shooter. and make attackers fair and fun !I made this code on a simple game. you can play it here, it took just 30 min for me !! it might you think if they do this the attackers becomes too powerful . but it's not right. in this way. you just have to take some distance from rear gunner. attack from sides hit and run. just it's suicide if you go close and fly in a straight line. Please watch the minutes 5:45 to the end. If they change the system of rear gunner, you always should play like when you're low hp and never fly behind the attacker or a bomber. and for AA your safe when your moving irregular and your in danger when you go straight. Edited by Dr_Ar_MG, 25 March 2018 - 01:32 PM. I think the bombers are a great addition for especially the heavy fighters. Now they have a real job to do.. and yes it can be unfair for a bomber to singled out by a heavy fighter, thats i why other heavy fighters and ordinary fighters should learn to protect their bombers.. Bombercommand in second world war sometimes had a cassulty rate at 76 procent! Thats alot. It was "easier" to survive as a british soldier in ww1 than being a bomber in ww2. A bomber falling out of formation on a bombing run, was sure to be dead meat.. As for AA, depending what you fly in, can be sometimes be hard when being the single player over a area, it all depends on how many allies there are in that area. Some skills for your pilots can help with that. As for the gunners, some with really good skills are hard to shot down. And if you are playing as a gaa or bomber with a good rear gunner, you can be really hard to shot down. it all depends on what skills you choose and some luck. And like i wrote first, a bomber flying alone, getting singled out by a good pilot, can be a pain. Just like it was in real life for those poor bombers. Bomb traps are still very useful, ive done that in a dogfight. manuverbility all depends on which aircraft you use, the il10 is bloody awesome to manuver! and so is the me 265.. I dont why people complain so much about everything.. for the bugs, yes it can be a [edited], but going on for about 4 weeks now, ive only tried to lose sound one time, and that was this friday... Not a single disconnect. Edited by jnishar, 25 March 2018 - 02:42 PM. yes IF the some planes of the team (human and bots) support the bomber, no problem for him. and yes of course IF your gunner has good skills it becomes better and esier for the bomber. bomb trap is still useful yes it is but as it was before. the only reason that's possible is, now game has some new players (pity they will leave soon) and idiot bots and it's more crowded . yeah if a bomber has the IF, IF, IF, IF, IF,.... it becomes easier for him. yes it will be easier for the Bomber and harder for the enemy. but I'm not talking about its easy or it's hard, it's fair or unfair.,I'm talking about game play. and yes if the attacker could get larger by eating mushroom , you say you need to fly over mushroom area and need more mushroom eater skills. or if bomber could fly over coulds and protect them selves by the firelight against enemies ,you said you need to fly over black clouds...and players need to learn how to play. and it's all true. now please read my post carefully to get it. straight near the rear gunner it must be a suicide . ok ? got it? look at the picture ....a head shot !!!! 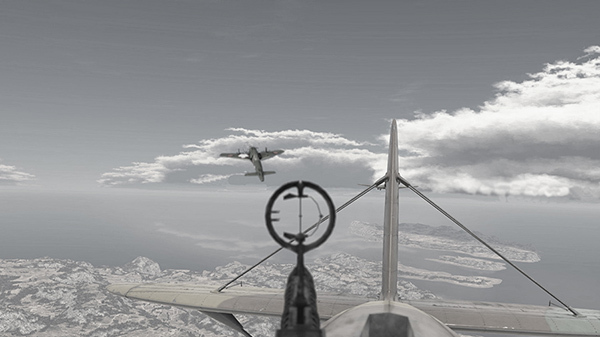 flying with bomber is not fun,for most of the players.. they are new, it's fun to try some battles.first time I heard they want to add bombers with gunners control, I said myself, wow what a great idea, now I can hold the right click watch around and if an enemy was close to me also control my plane same time ,shoot to him. but when I saw 2.0 I became disappointed.PLEASE don't say : you can change the key "T" with "right click". All I said was this : - when a plane is close to the rear gunner, the rear gunner must be superior. when the plane is far from the gunner and is moving it must be toooo hard to hit him. - when a plane is going straight it should takes many shots from AA and maneuvering could save him. don't worry, It's not necessary to know WHY ,for you.. actually it's WG has to know why they complain, because WG needs them to make money...it's WGs problem not yours. Edited by Dr_Ar_MG, 26 March 2018 - 06:02 AM. A lone bomber vs a lone fighter would more than likely end with the fighter winning.. there is a reason why the luftwaffe had so much succes gunning down bombers. even at nights. When the p51s and the p47s were cut loss from staying close to the bombers and were permittted to chase luftwaffe fighters, then luftwaffe had serious problems.. I really really would like to see things from your point of view, but i simply cant.. My rear gunners is doing ok, and they arent that skilled, it all depends on circumstances.. Do you really want a bomber flying low, destroying planes left and right with the gunners if they would become boosted?? When im alone trying to take a mine, and i see a HF comming in, i know im in serius trouble.. Thats the consequnce for me trying to take a mine alone. should i have stayed with others? yes ofcourse, but i didnt. I just might have gotten that mine. I'm sure that if WG made the game as I said and if I said it must be as what it is right now, you came here and posted " no it's good "
I'm sure you like what ever WG does .if they made 2.0 as the first version and now it was the 1.9 as 2.0, now you were still agree. anyway. dude I'm talking about a better gameplay, if you want to play a realistic game go and install simulators. I'm a fan of simulators but I like WOWP as an arcade game. for an AA is it easier to hit a plane, when it's going straight or when it's maneuvering ? got it? yeah. I do it too. and as I told if we could enlarge bombers with mushrooms , so we usually fly over mushroom areas and eat mushrooms. man this topic is not about how to win with bombers and attacker. I said in 1.9 one the serious weaknesses of attackers was the gunner and now in 2.0 yes it's true that they are more effective than before but, the went a wrong way. it's not fun or realistic , a fighter gets too close to a bomber or attacker and destroy it easily and the attacker or bomber has not chance.the fun and wise and realistic way to kill an attacker/bomber is strike from sides hit and run, like when your low hp and want to kill an attacker. and in a good game a player must to be the winner ,independent on the team or plane. in a good game always there is a hope to win, but in 2.0 If you have a bomber and the enemy has a heavy fighter and focused on you, just back to hangar. it's defeat or a victory for your bots. i tried a game in 1,9 where 2 il-2 two seat kicked the [edited]out of 5 remaing fighters... there was no way we could get close them, without us getting gunned down by their rear gunner. They got me easily, they were flying close together... In 2,0 ive been shot down alot by that french nc 1070.. I belive this game has the same balance, and in some points, better than 1,9.. Im sorry you dont see it that way..
What you want is a b-17 flying low, wasting anything and everything around them.. got it..
Well im glad it aint gonna be this game you will be playing that because that aint gonna happen. this game is realistic enough for me. Edited by jnishar, 26 March 2018 - 07:39 PM. I don't mind balances here. I'm saying when you are maneuvering it must be harder for AA and gunner to hit you. when you are far from them it must be almost impossible to get a critical damage from a gunner. B-17 flying low???!!! are you sure? .... A-20 , A-26, B-25, Ju-88 and ...designed for low and very high altitude. and again many players are (were) playing this becuase it wasn't a realistic game. and for planes which are far and maneuvering must be a useless gunner. and for plane are not far and not too close , not turning fast but not flying straight ,I mean a plane with normal distance and low maneuvering...the gunner must be a normal gunner. It was always like that - higher tier plane had no issues with GAA (I'd suspect some artificial efficiency lowering for rear gunner against higher tier planes). Same tier can have issues, and lower tiers can be shredded, especially when rear gunners have enough perks. BTDT. nobody cares about the "opinion" of the wg paid troll, and a quite retarded one. Dr mg made excellent post, well argumented, with pictures, so that even idiots can understand. But of course it is too complicated for you to understand. I'm glad you don't play it.. if you obviously couldn't understand what I wrote, then are you blinded by agreeing to anything negative being written whether it's right or wrong. Edited by jnishar, 31 March 2018 - 09:21 AM. European Community → Deutschsprachige Community → Forum → Diskussionen zum Spiel → Gameplay → Wie findet ihr die brennende Küste?